Though Ayurveda treatments and the balancing the tri-doshas are the main concerns during your vacation, Lotus Villa has in-cooperated many educational and entertainment activities to balance your both physical and mental health in order to provide the guidance for a healthy lifestyle. Probably Ayurveda treatments and the customs of Lotus Villa may be strange for an individual who has grown up in different culture. Therefore, the series of lectures provide a clear understanding about Lotus Villa and provides an overview on Ayurveda. The first lecture explains about the key elements of Ayurveda and some interesting facts about evening activities, excursion and many more supportive tips to spend your holiday without any hassle. Basically Ayurveda healing process divides into three main steps such as nutrition, treatments and the medicine preparation. These aspects will be comprehensively described at three separate lectures by our doctors. Magic is really impressive and astonishing event which makes you happier and healthier. Though magic is a non-detachable tradition of western culture, now it has become a popular amusement activity in eastern countries as well. So you can experience an amazing magic trick with your friends while sharing the laughter and joy in your relaxing evening. This will be a simple yet interesting activity that you can have fun for few minutes. Moreover, as a hobby you can practice this because there are variations in serviette folding. 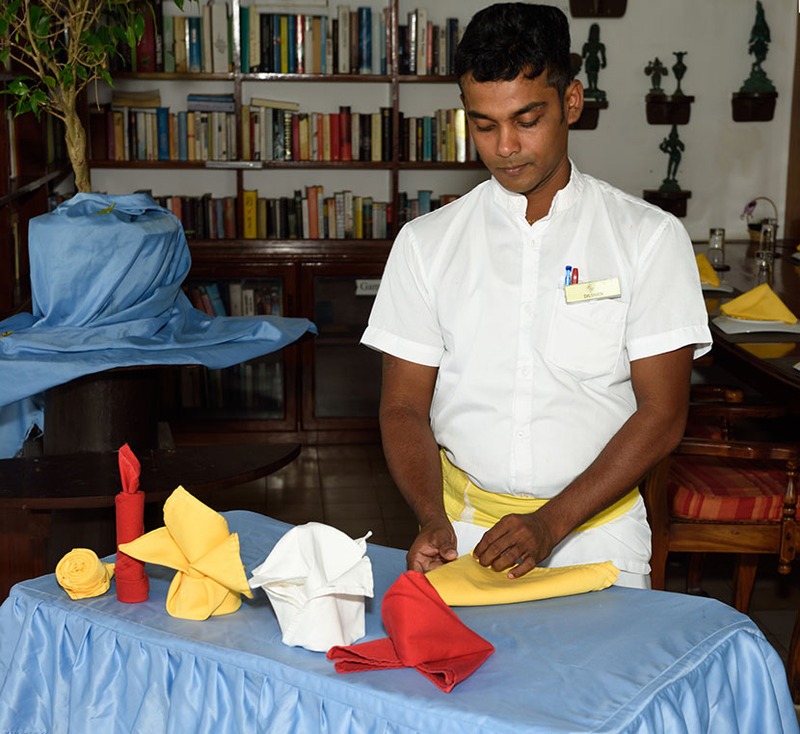 Waiters in our restaurant will help you in folding serviette. Music is a universal language and Sri Lankan music can be considered as a masterpiece of it. Because Sri Lankan music has four primary influences: ancient folk rituals, Buddhist religious traditions, the legacy of European colonization, and the commercial and historical influence of nearby Indian culture. 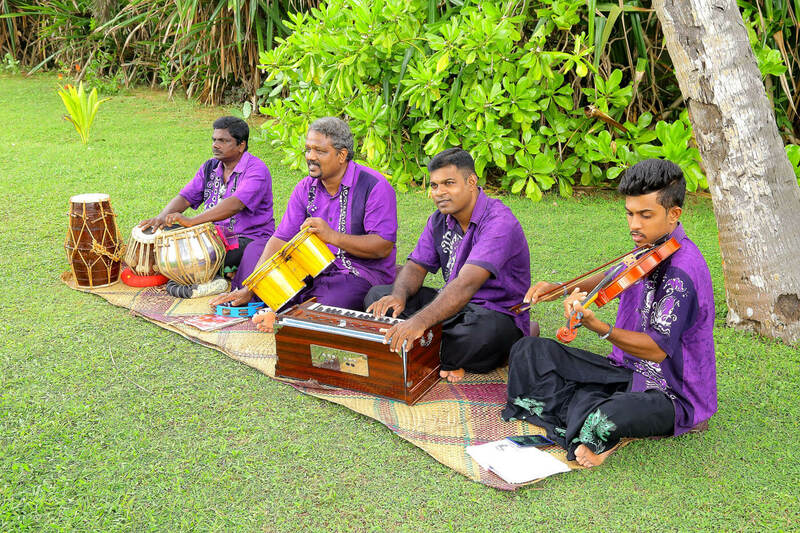 The oriental band at Lotus Villa plays few traditional music instruments like a serpina (a keyboard instrument), a flute and a tabla which is consisting of two pairs of drums while exposing you to a real experience of Sri Lankan music. 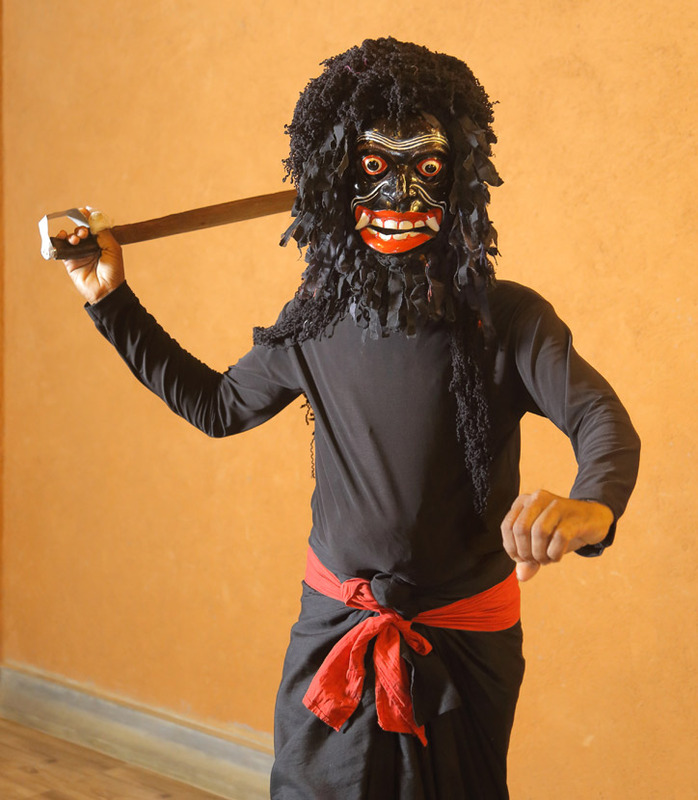 Devil dance is a key feature of Sri Lankan culture. It is considered as an indigenous dancing style which is evolved from the pre-historic man (“yakka”) in Sri Lanka. Basically this dance performed on a special arena which is decorated with freshly cut natural materials such as coconut palm tree and banana tree trunks. The dancer wears a mask and accompanied by the drummers. This will be an exciting event to enjoy. You will be entertained by both English and Sinhala music with the tune of the calypso band which is played by our staff members. Sinhala is the mother tongue of Sinhalese and 75% of the country speak Sinhala. It is a bit difficult but interesting language to learn. In this class you can twist your tongue with few Sinhala words and conversations. Astrology is the scientific study of stars to understand the correlation between celestial movements and human affairs on the earth in a meaningful way. The distant celestial objects like sun, moon, stars, and the other planets and their movements influence the human life from their birth. Zodiac system is the most familiar aspect of astrology. It consists of 12 signs (Aries, Taurus, Gemini, Cancer, Leo, Virgo, Libra, Scorpio, Sagittarius, Capricorn, Aquarius, and Pisces). Primarily, the Zodiac system helps to find out the personality of the individuals and for other divinatory purposes. Every individual gets a Horoscope or the birth chart which indicates their own sign of the zodiac. Astrology and the horoscope describes the personality, romantic relationships and predict their economic fortunes, among other divinations. At Lotus Villa, those who are interested in have the possibility of experiencing this amazing service during your stay period. 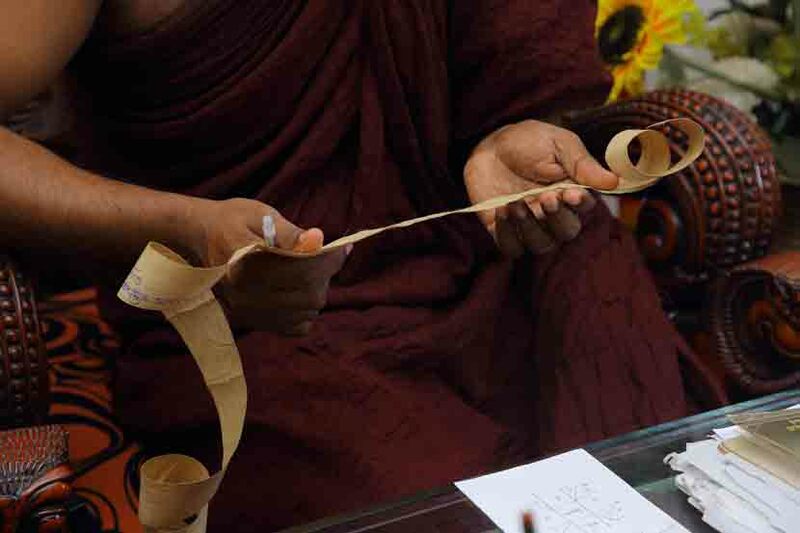 Our astrologer is an expert in this field and has many years of experience. Palm reading is a practice of reading the palm of an individual to trace out the characteristics and the future life of the particular person. Interpretations are done on the basis of the lines, skin texture, color, flexibility and the shape of the Palm. Furthermore, fingers, fingernails, and fingerprints are examined for deeper explanations. Heartline, Lifeline and the headline are the three major lines which always drawn the attention in palm reading. Most of our guests are very interested in palm reading. You too can hope to have a glimpse to your future with a palm reading session.